A space between your upper front teeth? 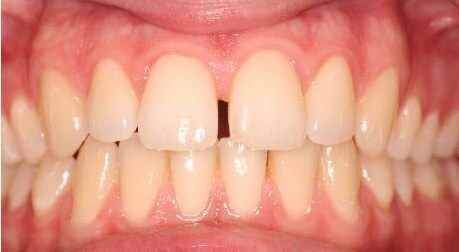 If you have a space between your upper front teeth like the photo shown above, it means that you are having midline diastema. In dental terms, midline diastema refers to an anterior midline spacing between the two maxillary central incisors. It is one of the most frequently seen malocclusions that is considered easy to treat but often difficult to retain. 1 ) Temporary malocclusion / Normal Developing Dentition : This condition is seen during ugly duckling stage of children aged between 8-9 years old after the eruption of central incisors. Treatment : This condition usually corrects by itself when the canines erupt and the pressure is transferred from the roots to the coronal area of the incisors. 2) Abnormal frenal attachment : The presence of a thick and fleshy frenal labial attachment can give rise to a midline diastema. This kind of frenal attachment prevents the two central incisors from approximating each other due to the fibrous connective tissue interposed between them. BLANCH TEST:- Lift the upper lip and pull in outward and look for blanching of the soft tissues lingual to and between two central incisors. Presence of blanch indicates high frenal attachment as cause of midline diastema. Treatment : Frenectomy should be performed. Generally advocated that the diastema should be closed as far as possible before going in for frenectomy. The reason cited is that should the surgery be performed before the surgical scar tissue maintains the diastema. Microdontia refers to teeth that appear smaller in size compared to normal. In this case the jaw size is normal but the size of the teeth is small which produces diastema between the teeth. Microdontia is most frequently seen in Down’s syndrome and ectodermal dysplasia. It is a developmental anomaly characterized by an abnormal large jaw.In this case the size of the tooth is normal but because of the increase in size of jaw, it results in diastema. Due to the missing lateral there will be tooth material-arch discrepancy as a result there will be drifting of adjacent teeth. 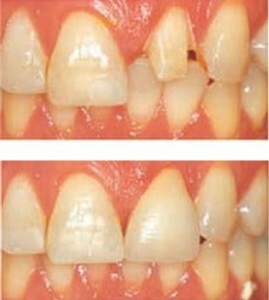 This also results in tooth material-arch discrepancy which causes drifting of adjacent teeth. 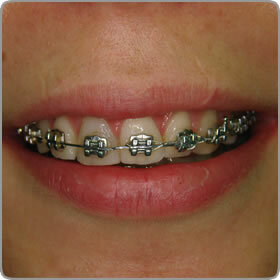 Such conditions can be treated by orthodontic means or by mean of jacket crowns or composite build-up. Closure by jacket crown or composite build-up is the best method. The presence of midline spacing also has a racial and familial background. The negroid race shows the greatest incidence of midline diastema. Thumb sucking is defined as placement of the thumb or one or more fingers in various depths into the mouth. This is a condition in which the tongue makes contact with any teeth anterior to the molars during swallowing. It also causes proclination of anterior teeth along with diastema and open bite. This habit is a self injurious habit. If the maxillary incisors are slightly spaced apart, the child may lock his labial frenum between these teeth and permit it to remain in this position for several hours. This causes ectopic eruption of tooth and formation of median diastema. 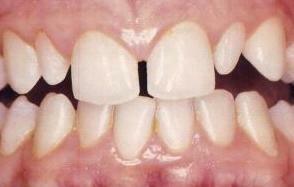 Presence of an unerupted mesiodens between the two central incisors also predispose to midline diastema. 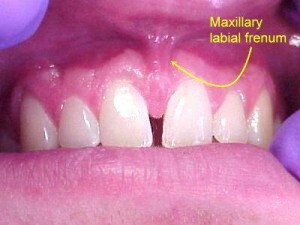 The presence of a thick and fleshy labial frenum can cause a midline diastema.This type of fibrous attachment can prevent the two maxillary central incisors from approximating each other. Soft tissues and hard tissue pathologies such as cysts, tumors and odontomes may cause midline. 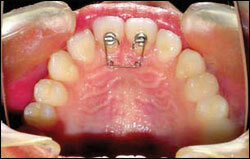 Simple removable appliances incorporating finger springs or a split labial bow can be used. 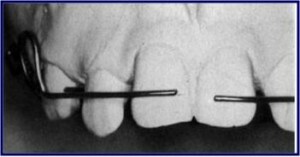 Finger springs can be given distal to the two central incisors. Split labial bow made of a 0.7mm hard stainless steel wire can be used. In a reciprocal tooth movement the forces are applied to teeth Fare equal and opposite as a result each unit moves to a normal occlusion. A) Closure of a midline diastema can be accomplished with a removable appliance and finger springs to tip the teeth mesially. B ) The 28 mil helical finger springs are activated to move the incisors together. C ) The final position can be maintained with the same appliance. Fixed appliances incorporating elastics and springs bring about the most rapid correction of midline diastema. Elastics can be stretched between the two central incisors in order to close the space. Elastic thread or elastic chain can be used between the central incisors. M shaped springs incorporating three helices can be inserted into the two central incisor brackets. The spring can be activated by closing the helices. chain provides the force to slide the teeth along the wire. C) immediately after space closure, the teeth are retained, preferably with, (D) a fixed lingual retainer at least until the permanent canines erupt. 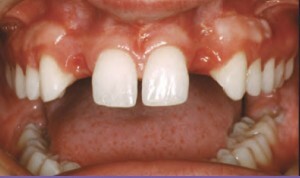 Midline diastema is often considered easy to treat but difficult to retain. Esthetic composite resins are used to close midline diastema especially in adult patients. It requires gradual composite build up on the mesial surface and stripping of the distal surface of centrals and laterals in order to achieve a natural shape and size of the teeth. Presence of peg shaped laterals or teeth with other anomalies of shape and size require prosthetic rehabilitation. This entry was posted in Uncategorized and tagged diastema, fixed appliances, space between teeth, ugly duckling stage on October 2, 2011 by meifong.